The perfect organizing folder assortment, these strong, tear-resistant polypropylene folders divide, organize and color code your many projects. Use by themselves or to subdivide file folders. Sealed on two sides, each folder is made for easy loading and access. Polypropylene means no photocopy transfer-safe protection for your hard work. For 8 1/2 x 11 materials. Contains 5 each smoke, green, red, blue & yellow. 25/BX. Hi, I'm John with C-Line. Today we're going to talk about our Colored Project Folders. 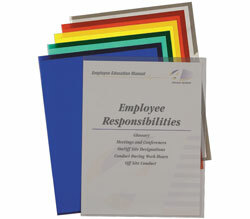 Because these colorful folders are made from heavyweight polypropylene, they feel thin and light. They are extremely strong and durable. They are open on two sides with a thumb cut on the front for easy access to your papers. And the unique corner design expands to hold up to 100 pages. Available in five rich translucent colors, these project folders are a great way divide, organize and color-code your projects. The top sheet remains visible through the folder so you can identify projects quickly. Use them by themselves, or to subdivide file folders with multiple projects and activities. C-Line's Colored Project Folders store projects, reports, paperwork and more. They are great for organizing your home, school and business. Order yours now! That's all we have for today. I'm John with C-Line. Thanks for watching.